In January we have big anniversaries of classic skate punk album/punk rock albums. Lagwagon Trashed was released 25 years ago on January 4, 1994. Bad Religion – How Could Hell Be Any Worse was released 37 years ago on January 19 1982. 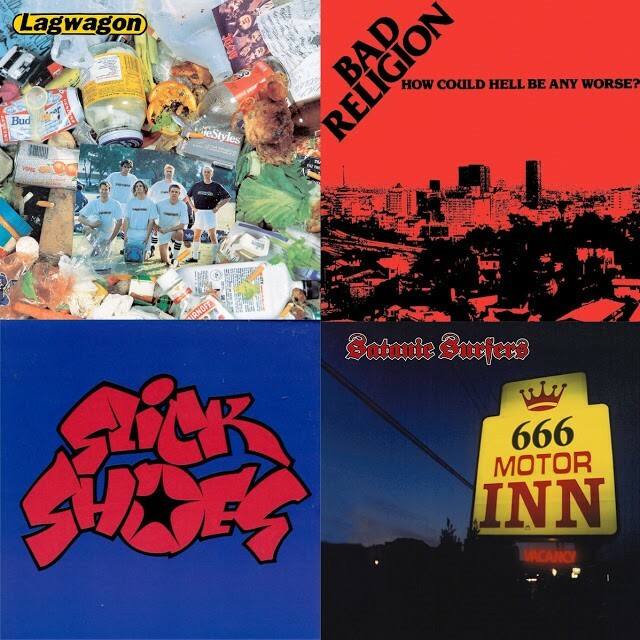 Satanic Surfers “666 Motor Inn was released 22 years ago on January 21 and Slick Shoes EP was released 22 years ago on January 21. It’s gotta be Trashed. I think Trashed was a much better version of Duh. I think the songwriting was better and there are some songs on that record that I still play a lot acoustically that really work. That’s a good test for me as a songwriter, you know? I also remember Derrick’s amazing drumming on that record because he was so good. But there are some songs on there that we don’t really play live. There’s a song called “Whipping Boy” that I sometimes played acoustically live and it actually still sounds like a decent country song, considering that I wrote it when I was in my early twenties. The style of music you guys were playing was exploding then. How do you look back on that era of Lagwagon and punk now? I remember listening to Green Day and saying, “This band is gonna be huge! Watch what’s about to happen.” It seems like the timing was right, but it didn’t have a huge effect on us at all. We had almost no solicitation from major labels, unlike almost all bands. I don’t think we had the accessibility that you needed for that kind of thing. We were a little too metal and fast. We weren’t pure enough pop or whatever. I always thought it was a good thing, you know, we’re just gonna keep doing what we’re doing and in the long run all this other stuff will come and go. Of course Green Day didn’t, but a lot of other stuff did.